Marguerite A. Landis, age 90, passed away with her loving family by her side on Monday, July 20, 2015, at St. Clare Commons, Perrysburg, Ohio. She was born in Toledo, Ohio on September 22, 1924, to Frank and Marguerite (Baude) McManus. She was a teacher for Maumee Schools and was a member of St. Joseph Catholic Church in Maumee where she served on the Altar Society. Marguerite was a former Girl Scout leader and a member of the Maumee Book Discussion Group for over 20 years. Marguerite is survived by her daughters, Sharon and Terri Landis; grandsons, Ryan (Johannah) Moore, Daniel and Matthew Cox; sisters, Dolores Meyer, Ann Alexander and Patricia Nesbit; sisters-in-law, Ann McManus and Marjorie Wagener. She was preceded in death by her parents and husband, William; brother, Frank McManus and sister, Mary Francis Brigode. Rita Jeanette Clarahan Pinciotti was 91 when she passed away on July 18, 2015, in Columbus, Ohio. The residents and caretakers at Highbanks Care Center remember Rita as a “lovely lady who was always smiling”. Rita was born on February 5, 1924, in Waterloo, Iowa. She was preceded in death by parents, James and Irene (Striegel) Clarahan; her sisters, Marian, Marguerite, Teresa, Alice and Eileen, and brothers, James and Fr. Michael Clarahan, OFM. Rita received a scholarship to college, but due to limited family funds chose to join the workforce. Always independent and adventurous, Rita was the first woman to work in the roundhouse for the Illinois Central Railroad in Waterloo, before moving into the office. She also worked in San Francisco for Hearst Publishing Co. before marrying Don Pinciotti and eventually moving to Toledo, Ohio in 1954. She had eight children and the children’s care and education were of vital importance to Rita. 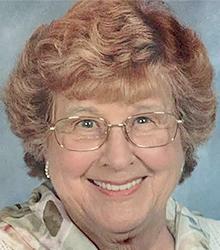 She had strong religious beliefs and was an enthusiastic volunteer in her church, school, and community all her life. Rita was a member of St. Patrick of Heatherdowns Parish for 50 years, working as a lunchroom mother at the school, Boy Scout Den leader, and member of the funeral choir for over 20 years. Family and friends knew her for her open heart and ready smile. She loved tennis, music and knitting, but mostly enjoyed being with her family, teaching them card games and doing crafts. Rita was an amazing, loving mother who encouraged each of the eight children to do their best and follow their dreams. She made sure each had the opportunity for a college education and took pride in everyone’s accomplishments without comparison. “Rita-Baby”, as she was affectionately called, is survived by her children, Pat Pinciotti (Howard Rappaport), Rocky (Joan Glase), Ronnie Pinciotti, Dennis (Anita), Rosemary Quaranta (Michael), Philip (Kris), Dino (Lisanne) and Frank. She was equally proud of the abilities, and successes of her twenty-one grandchildren, Zak, Nikki, Jesse, Gabe, Andrew, Christopher, Michelle, Jaclyn, Dan, Caitlin, Kevin, Dean, Ben, Andrea, John Paul, Tori, Livy, Mimi, Mike, Julia, Lauren and delighted by her four great-grandchildren, Bailey, Dean, Vincent, and Sadie.